The labour movement is critical to the lives of working people. 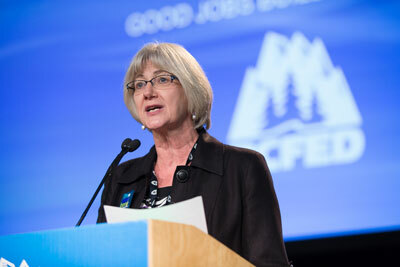 The BC Federation of Labour is the collective voice of workers in BC – representing half a million people who work in every aspect of our economy, in every region of the province. We are a vital voice in shaping our growing communities. As a movement we tackle issues that impact everyone – safe workplaces, minimum wage, pension and retirement security, protection of public services, and so much more. Our advocacy has made significant changes for the better – but we have more work to do. We must remain committed to the long-term project of building a province and an economy that works for everyone. Our greatest strength is our people and our passion. I look forward to working with all of you in the years ahead, and advancing the campaigns and issues we know make a difference.